Handsome face and hairy chest! The hen is bound to be happy with your choice of man to be her chaperone on her big night. 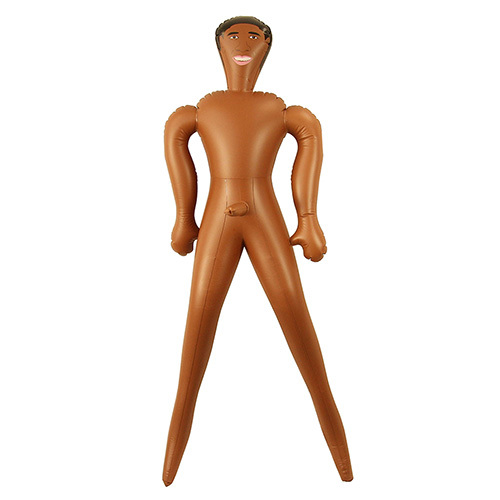 This life size blow up male doll absolutely guarantees laughs among the girls as well as making the photos of the event that much more entertaining. As inflatable male dolls go, this guy has it all, a broad smile, a hairy chest and bulging muscles, he doesn't say alot though and, like most men, will require a good blow to get him going! 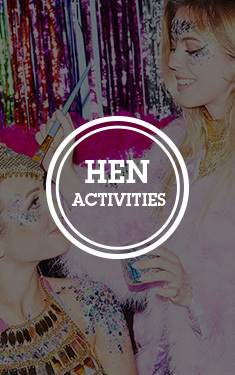 If you are looking to make the hen night a unique and memorable experience a life size doll is certainly a step in the right direction. "Really good - this went everywhere with us!" "Good fun and lasted the night." "Had to be reinflated a few times through out evening." "After the first night it deflated, but was a good laugh." "Went down an absolute treat and stayed inflated for the whole weekend!" "Love this item. Will do the job perfectly without causing any offence. Good price too! " 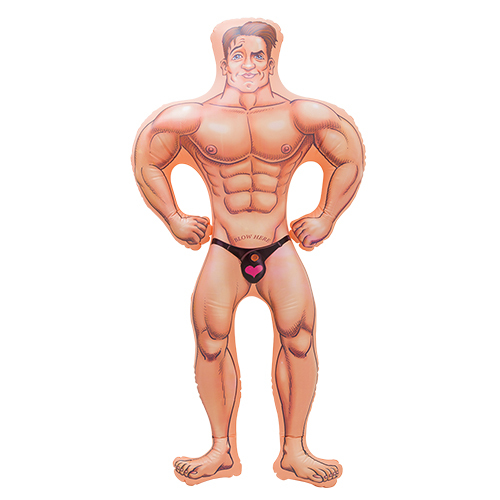 "So much fun and got lots of attention from taking my blow up man on my hen do!! I did have to put a picture of Daniel Craig over the dolls face tho!! " "Terrible, on first blowing it up we realised it was punctured n the foot, we repaired it with the patch however it has another hole in the arm.. threw away as a bad job." "Excellent, this inflatable male doll was a brilliant laugh, we named him Derek for some reason & drew on some extra bits!! He was up on the dance floor with us & is coming with us on our hen weekend in Magaluf." "really happy with this product! think the hen will love it!!" "This inflatable male doll Was very funny got lots of attention in town many people wanted a picture with him but he needed a little extra attention to detail we added boxers and a mini willy :-)"
"Great product, stayed up all night and was still erect in the morning, many laughs had." "had fun with this but not really worth the money,,cuz see yellow hair of the woman face behind the mans black hair"
"Big Geoff!! He was such a celebrity. The perfect chaperone for any hen do. Great quality, was much better than expected. I'm hoping he can make it to the wedding too." "not blown him up yet but it looks good and im sure it will do the job as it looks decent material and well made!" "He was great we named him Bob." 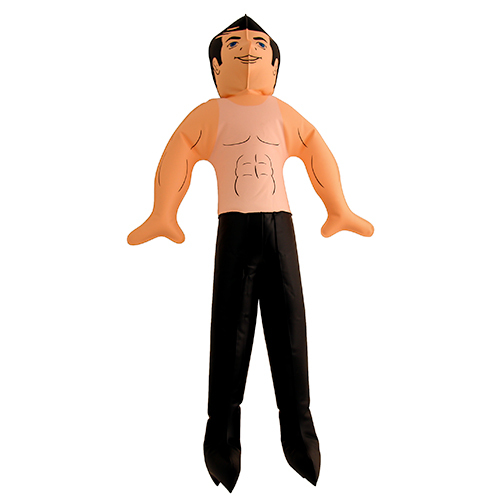 "My sister loved this inflatable male doll, it was so funny it made her cry. I did put a picture of her husband to be on it and a lovely pair of boxers but she thoroughly enjoyed his presence on her hen weekend!!!" "The blow up doll only lasted an hour as it had a puncture under one of the arms"
"He's a rather funny looking chap but really made us laugh. He had very womanly legs." "just what we wanted, really funny!!" "So funny, cant wait to bring him on our hen holiday!" "Got a lot of attention! Only lasted one night though - got bitten by some drunken idiot and couldn't repair his puncture! Also had to blow up quite a lot (probably because of the dancing he was doing!" "Perfect. The hen was very surprised to find him in her bed after a night out haha!" "We had such fun with 'Patrick' he came clubbing with us and we dressed him up for the wedding. He was definitely worth the money." "The blow up doll made the Hens night, he was named, was still inflated even after the break dancing on the dance floor. Was the best buy ever and he is even making an appearance at the wedding." "Once accessorised made many people laugh and also made people stop and talk to him when we were waiting on a taxi (which made us worry about the people of Glasgow). Great conversation piece." "Unfortunately Nicks arm ripped at the seam whilst I was taking his footy kit off. Wasn’t a major drama as he'd lasted throughout the Mr & Mrs game." "Perfect addition for the evening! Because he has no 'bits' he is inoffensive. We had lots of fun with him throughout the evening and ensured the bride to be got lots of attention." "Disappointed – deflated early on but I give this one out of ten cause though he broke he had a hilarious face." 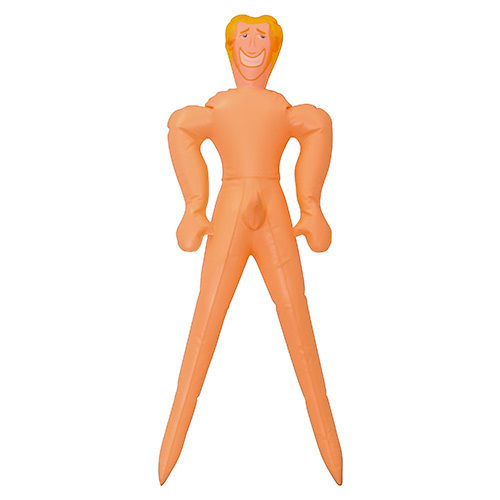 "There was limited description of this product and I was disappointed by the size, it was only about 40 cm tall." "This blow up doll set the party off to such a hilarious start and provided entertainment for the rest of the night." "Great! Can't wait to blow it up and see my friend's reaction." "Brill, he was our Juan the fireman and he came with us everywhere!" "definitely worth the money. didn't last very long but only because he was mistreated"
"A huge hits with the girls. We were all dancing the night away with him,but transporting him to the venue was a hoot..something out or fool & horses. Actually another women took him home..nevermind!" "He was the main attraction of the night. The Hen loved him and we fashioned him some pants! The one bad point is that his face is oddly shaped and has a plastic join right in the front. " "Best buy yet.....he woz a BIG HIT with the hen party ladies, they all fought over who woz gonna dance with him!!!" "Star of the night. Everyone wanted a hold & a dance. He got a lot of action!!" "A great laugh. ''Brad'' went everywhere with the bride and was very popular with the public (even the men). He even came Go Karting and saw the sights of Liverpool. Non offensive and a good laugh." "Purchased for the 'hen do'Softened the blow of the below item"
"Product as described will be great for the occasion, Thank you!!" "Perfect to embarrass your hen!" "Ryan was amazing...we had lots of fun getting him clothed. However after some rigorous action by some boys- he didnt quite survive the night!"